In the fragile moonlight she leaped out of the pool, took a breath and began her transformation. This entry was posted in art in a box, nichos, retablos, Uncategorized and tagged art in a box, curious boxes, nichos on September 28, 2016 by chestnutandhazelnut. A bit early for the baby but.. 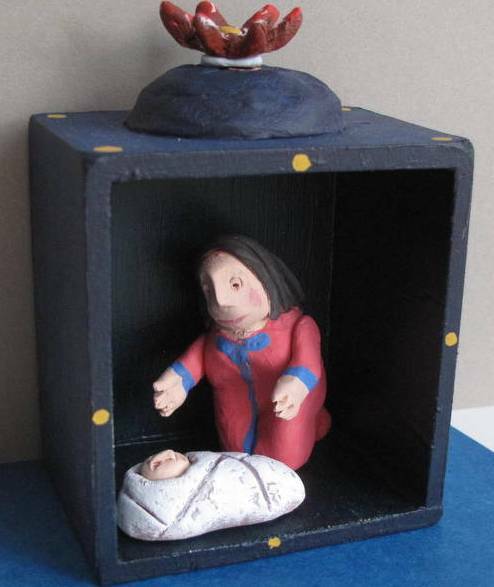 This entry was posted in art in a box, nichos, retablos on December 14, 2015 by chestnutandhazelnut. Adrienne Craddock Behold! Dear Fish. This entry was posted in art in a box, nichos, retablos on December 13, 2015 by chestnutandhazelnut. 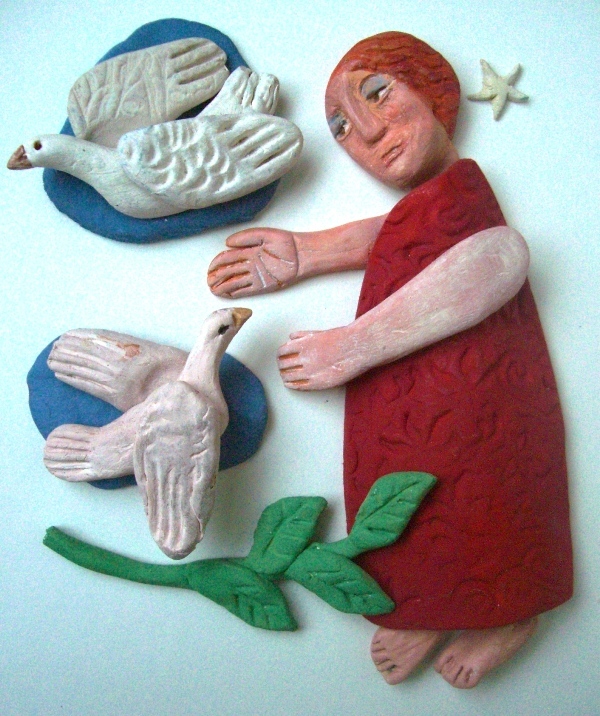 Lady in a red gown communes with the doves. 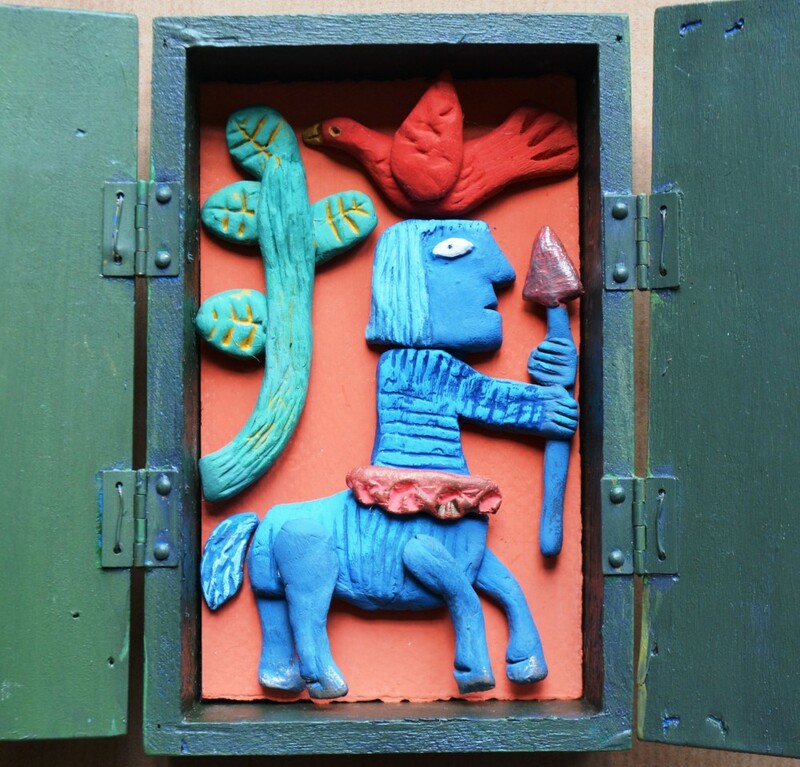 This entry was posted in art in a box, nichos, retablos on August 11, 2015 by chestnutandhazelnut. Warrior is inspired by an image carved onto a stone font in a small Devon church. This avenging half horse half human figure looks like it has viking influence and is depicted as staving off dragon-like beasts. We all need one of these to help us through life. This entry was posted in art in a box, nichos, retablos and tagged Abergavenny, nichos on April 23, 2015 by chestnutandhazelnut.